Fed up with stressful holidays with little-ones, mum of three Wendy Shand, made a vow to help parents find the perfect child-friendly holiday. She set up TotsToTravel.co.uk nine years ago, now an award-winning luxury holiday company that specialises in baby-friendly holidays. Every Tots To Travel resort, villa and cottage is vetted by the team for child safety hazards and all swimming pools have some form of barrier. A unique Essential Kit of over 20 items of baby equipment from blenders to black-out blinds is also guaranteed at all Tots To Travel holidays. As an expert in family travel, here Wendy shares her six tips on taking the pain out of packing for your family holiday, and picks her top holiday items from our collection. Always write a list and work from that, splitting the list into different categories. Start the list early and add to it as things pop into your mind. If you’re super organised then you could put your list onto the computer and then you need only print it out when you need it. When the children get old enough you give them their lists and they can pack for themselves. Well in advance, start putting together a pile of bits and pieces that you will want to pack. I start to order items like sun cream, sun suits and sunhats online and well ahead of my holiday. They are kept safely in a cupboard until I am ready to pack. I have a collection of string bags so I can separate out items like socks and pants, this is particularly useful for older kids so they can find things quickly and easily. It’s very tempting to pack too much but the reality is that, for a family holiday, you need much less than you think! Shoes in particular take up lots of space so be ruthless with what you pack, giving some thought to the different occasions that you might need to clothes for. It’s worth packing some fun so do consider adding pool toys, a new colouring book and crayons so that you have something up your sleeve to thrill! Pool toys or water bombs (!) are a definite crowd pleaser. I like to have something that the children can do quietly in the shade, so stock up on sticker books, puzzle books or dot to dots, depending on their age. We’re all travelling with more gadgets. If you’re flying make sure you have these and their cables in your hand luggage so that you can easily find them in order to go through security. Likewise, liquids need to be in a plastic bag and less than 100mls .They will need to go through security or else put in the hold. Sun protection is a must. This UVA and UVA protection sun suit is perfect and reduces the amount of skin exposed. It comes with a matching sun hat to ensure baby is covered from head to toe. Don’t forget to use a high protection sun cream and keep your little one out of the sun between 11am and 3pm. Shield delicate eyes from the sun, team them with a handy neoprene strap to help them stay put! 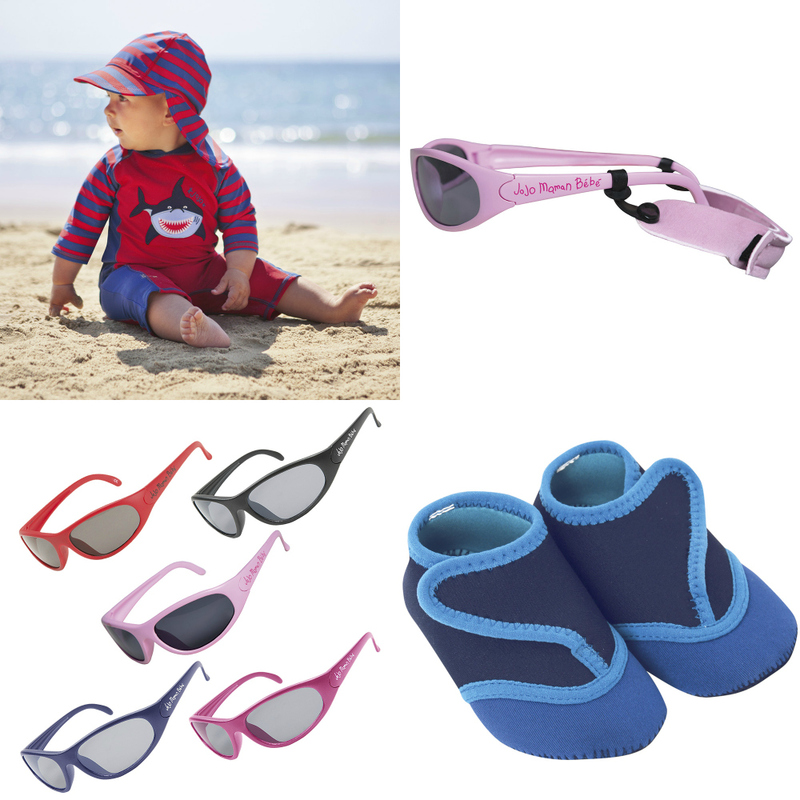 Protect your toddler’s feet from hot sand, shells and stones. These are quick-drying thanks to the neoprene material and with an anti-slip sole, are perfect for lazy days around the pool. Perfect after a dip in the sea. Easy to pull on and with poppers to make quick arms, little ones can become snuggly and warm in and instant. A must-have when packing, offering multiple uses. Use for warmth, a make-shift sunshade, or as a play mat on the beach. I love these reversible tops. They’re perfect for covering up if the weather turns cooler and are space saving, offering two looks for the packing of one. 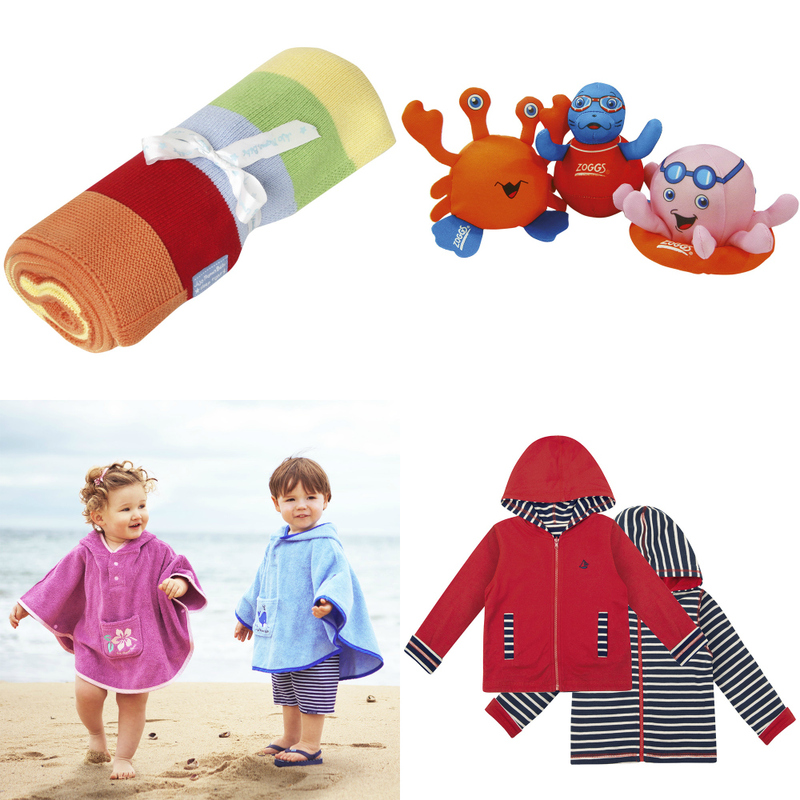 Leave room in your suitcase for these colourful characters, to ensure lots of pool time fun.